Bust of A.W. Ross on Wilshire Blvd. @ Curson Ave.
Alvah Warren Ross better known as A.W. 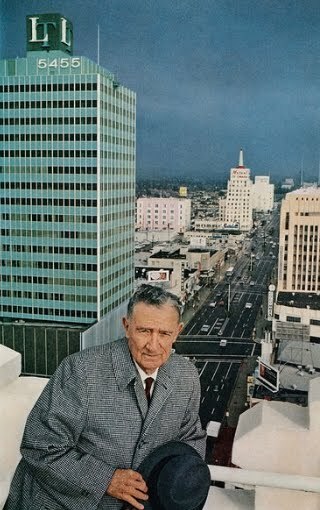 Ross (1878-1967) was the visionary realtor that made the stretch of Wilshire Boulevard between Fairfax and La Brea Avenues into the Miracle Mile. There is a statue of A.W. Ross on the corner of Wilshire at Curson. The inscription reads, "A. W. Ross. Founder and Developer of the Miracle Mile. Vision to see. Wisdom to know. Courage to do." I'm sure thousands of people walk by this statue every day and never even glance at it or realize how ingenious and enterprising this man was. 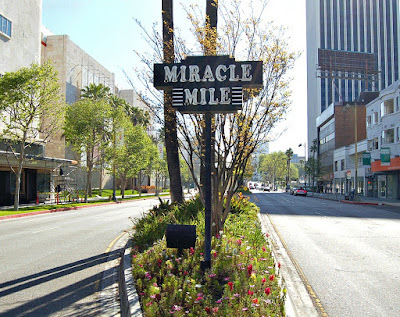 Way before Ross's development of this area, Wilshire Boulevard was a dirt road filled with barley fields and cattle ranches. Once the automobile was more popular and affordable, the road was paved and small housing developments cropped up north and south of Wilshire. It wasn't until 1920 when Ross purchased 18 acres along Wilshire that "Wilshire Boulevard Center" began to take shape. Between 1920 and 1928 people called this strip of Wilshire, "Ross's Folly." So, Ross enlisted the help of department store owners from Downtown Los Angeles and other businessmen to build along Wilshire Boulevard due to their proximity to the wealthy areas of Hancock Park and Beverly Hills. He also made sure that these businesses provided plenty of parking for the new car owners of Los Angeles. 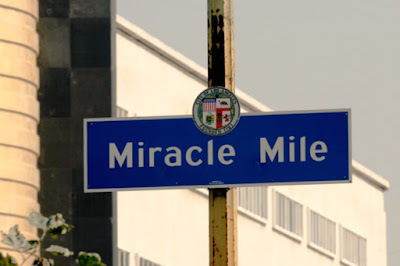 This is when his friends realized that Ross's Folly was really a miracle and they dubbed the area "Miracle Mile." The name stuck. In the past 85+ years, the Mile has gone through various economic changes. Although, no longer home to many department stores and shopping areas, it offers apartments, office buildings, world famous museums, restaurants and is a magnet for the people of Los Angeles and it's many visitors. It bothers me when journalists and television news media refer to this area as Mid-Wilshire. It is not Mid-Wilshire. That's a few miles to the east (aka Korea-Town) in the MIDDLE of the City. 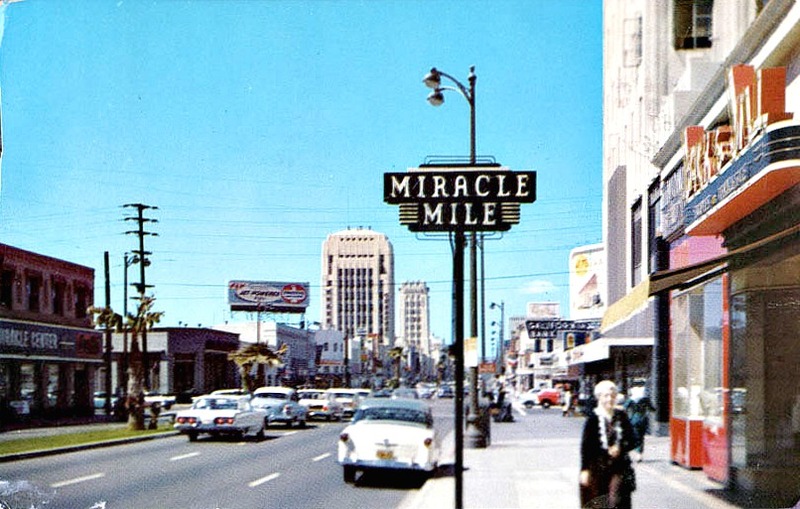 This is Miracle Mile, west of Western Avenue, which is traditionally WEST Los Angeles. There are signs up and down Wilshire designating it so. Thank you, A.W. Ross for your vision and perseverance in making this portion of Wilshire Boulevard so grand! Yet another example of what places L.A. Is My Beat among my most enjoyed blog subscriptions. Thank you so much, Richard!! !